The Amish are famed the world over for their rocking chairs. This Amish Legacy Oak Wood Windsor Kid's Rocking Chair - handcrafted from solid oak wood and sanded by hand to a perfect finish - carried centuries of American heritage in every one of its beautiful surfaces and joints, bringing the heirloom quality and strength of traditional woodworking to the family home. 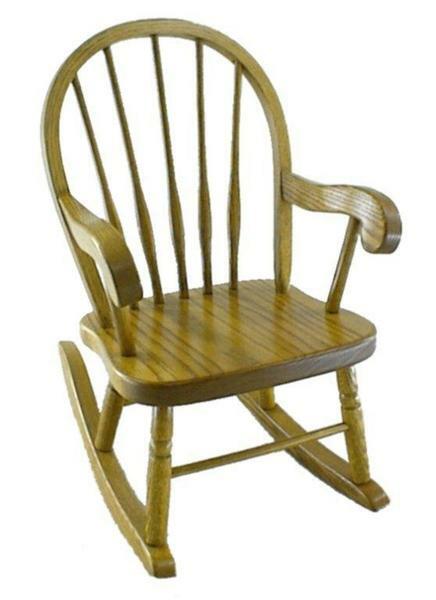 The Legacy Oak Wood Rocking Chair design is a time-honored masterpiece that has remained unchanged for so long simply because there's no real way to make a kids' rocking chair any more classical or beautiful than this. Every element of this rocking chair is handcrafted to order in a small Amish woodshop in the northern United States. The strength of the native oak, combined with this chair's true-tested design and hand-finished surfaces, gives the Legacy Rocking Chair the strength it needs to serve the home for as long as the kids, grandkids, and great-grandkids need a kid-sized spot for reading, relaxing, or passing the hours with favorite friends. Use the menus above to create your order. If you've any questions at all, please don't hesitate to get in touch with us by phone or by email at any time - our families are at the heart of everything that we do, and we would love to talk to you about the countless beautiful memories that rocking chairs like this bring to the family home. Seat Depth at Center: 12"